Blasdel, Alex. ‘A reckoning for our species: the philosopher prophet of the Anthropocene.’ The Guardian, 15 June 2017, https://www.theguardian.com/world/2017/jun/15/timothy-morton-anthropocene-philosopher. Blum, Andrew. ‘Children of the Drone.’ Vanity Fair, June 2013, https://www.vanityfair.com/news/tech/2013/06/new-aesthetic-james-bridle-drones). Bridle, James. New Dark Age: Technology and the End of the Future. London: Verso, 2018. Espredy, Gabrielle. ‘Building Data: Field Notes on the Future of the Past.’ Places Journal (September 2013), https://doi.org/10.22269/130923. Giedion, Sigfried. Mechanization takes Command: A Contribution to an Anonymous History. W.W. Norton and Company, 1948. Harman, Graham. Tool-Being: Heidegger and the Metaphysics of Objects. Chicago: Carus, 2002. Harman, Graham. Object-Oriented Ontology: A New Theory of Everything. London: Penguin Books, 2018. Heidegger, Martin. Being and Time. New York: Harper and Row, 1962. Levinson, Mark. The Box: How the Shipping Container Made the World Smaller and the World Economy Bigger. Princeton: Princeton University Press, 2008. Lyster, Clare. Learning From Logistics: How Networks Change Cities. Basel: Birkhäuser, 2016. Maheshwari, Sapna. ‘Hey, Alexa, What Can You Hear? And What Will You Do With It?.’ The New York Times, 31 March 2018. https://mobile.nytimes.com/2018/03/31/business/media/amazon-google-privacy-digital-assistants.html?smid=tw-share. Norwood, Bryan E. ‘Sigfried Giedion (2013) Mechanization Takes Command: A Contribution To Anonymous History. Minneapolis: University Of Minnesota Press.’ Culture Machine (2015). https://culturemachine.net/index.php/cm/article/viewFile/576/583. Sandes, Sabella. ‘Post-Humanist Art and Speculative Realism.’ Interactive. https://interartive.org/2018/04/post-humanism-speculative. ‘Squaring The Circle That Is Square’, Pymnts.com, 17 April 2017, www.pymnts.com/mpos-tracker/2017/square-jack-dorsey-cash-capital-first-data-vantiv-paypal-uk-apple-pay-debit-pymnts-mpos-tracker-mobile-payments-mobile-point-of-sale/. Wilson, Richard Guy, Dianne H. Pilgrim, and Dickran Tashjian, The Machine Age in America, 1918–1941. New York: Brooklyn Museum, 1986. Wired, 30 July 2017, https://www.wired.com/2014/07/exclusive-square-bets-big-on-next-gen-credit-card-tech/. Clare Lyster is an architect, writer and Associate Professor at the University of Illinois at Chicago. She is author of Learning From Logistics: How Networks Change Cities (Birkhäuser, 2016) that explores the implications of logistics for architecture and urbanism. Her research on the topic has been exhibited at the Lisbon Architecture Triennale (2016) and The Seoul Biennale of Architecture and Urbanism (2017). LYSTER, Clare Louise. Territories of Equivalence. FOOTPRINT, [S.l. ], p. 25-36, nov. 2018. ISSN 1875-1490. Available at: <https://journals.open.tudelft.nl/index.php/footprint/article/view/2100>. Date accessed: 21 apr. 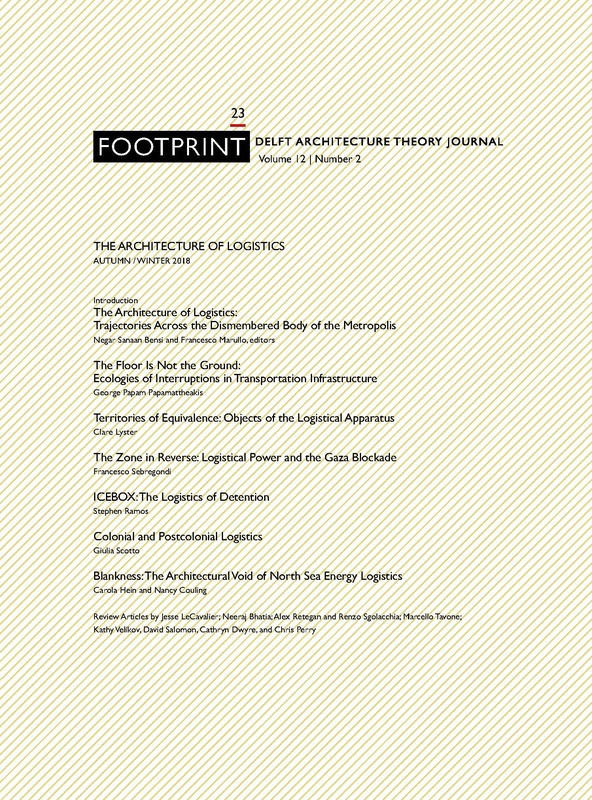 2019. doi: https://doi.org/10.7480/footprint.12.2.2100.